"Inspiring: a community network of young professionals and older neighbours determined to combat loneliness in our society – one of the greatest public health challenges of our time." 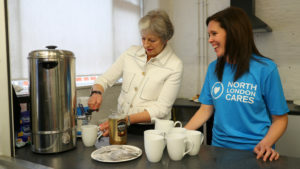 "It's great to see so many individuals and organisations that are doing great work...like North London Cares which is helping the old and the young to connect." "An amazing organisation; an incredible organisation." "A project whose time has come." "Exactly the right approach at exactly the right time in a city that needs it." "One of the most positive projects emerging from post-riots London." "London may be the world's greatest city but can be isolating for many. Fine film on @NLCares' work connecting people." "A brilliant initiative... I'd roll out the North London Cares franchise across the country."